Radon - Welcome to the Paha Sapa Grotto! 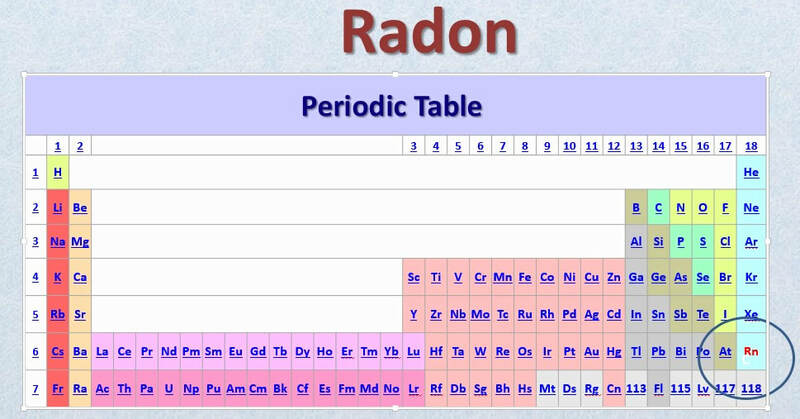 Radon (Rn) is the heaviest of the naturally occurring noble or inert gases. This radioactive gaseous element has no stable form in nature but is rather a mixture of its 36 naturally occurring albeit short-lived radioactive isotopes. The longest lasting of these isotopes (Rn 222) has a ½ life of just 3.8 days, so at any given time there is not much to be found in nature and in fact, there are only a few tens of grams of Radon present at any time in all of the Earth's atmosphere. This does not seem like much of an abundance to be concerned with, but this merely represents the steady-state flux of a gas that is constantly being regenerated. As such, it still represents an important and omnipresent atmospheric component. Radon reaches a steady-state concentration quickly and does not build up past a certain level due to this constant decay, so it is always present and generally found to be at a very constant and uniform concentration within the atmosphere as a whole. Within caves, however, there is far more variability than is seen within the atmosphere, and that variability can give valuable clues as to the atmospheric dynamics and passage geometries found within the cave system. Radon can also provide insights into the nature of the solutions and bedrock geochemistry involved in groundwater evolution and the system's speleogenesis. Radon is moderately soluble in groundwater at normal spelean environmental temperatures and pressures. As a consequence, its concentration in subsurface atmospheres varies with the degree of ventilation, groundwater solution equilibrium, background Rn gas levels in the surrounding formations and temperature. Like carbon dioxide, radon (Rn) concentrations in cave-air typically exhibit seasonal variations, with summer maxima and winter minima where there is at least some groundwater transport through the vadose horizon. Less variability is typical in systems that are completely dry, although ventilation, Rn gas values in the host rock and temperature related variation may still be evident. The relatively steady concentration of ambient radon gas in both above ground and subsurface atmospheres is due to constant additions from the radioactive decay of uranium (U) and thorium (Th) found in natural materials. The decay chains for these two actinide elements are a significant source of the normal background radiation in our environment, and the origin of most of the helium (He) present within our atmosphere. One of the principal ways in which radioactive elements decay is by alpha particle emission. An alpha particle is nothing more nor less than a Helium (He) ion that quickly captures a couple of stray electrons to become helium (He) gas. Although Radon is radioactive, it is still a nonreactive noble gas from a chemical standpoint, which means that it is inert and essentially non-toxic from purely chemical considerations. It does not dissolve readily in water, nor does it react chemically with organic tissues, or is it absorbed or used in any way by the body. Radon has absolutely no tendency to accumulate in the environment or within living organisms, either. Regardless of its seemingly innocuous chemical behavior, however, radon’s radiochemical activity must always be addressed when its effects on living organisms are being considered. The adjacent nuclear reaction is the portion of the decay of Uranium 238 into Lead 206 that produces Radon 222 gas. Rn 222 is the most abundant of the radon isotopes and the only isotope that the name "radon" formally applies to, although in practice they are all usually lumped together under this name. Both uranium (U) and thorium (Th) readily substitute for the calcium (Ca) atoms found within mineral structures, and even though these two elements are found at very low levels in most rocks, enough radon is produced thereby to keep the background atmospheric concentration at about 6 x 10-16 moles/liter. The equivalent to this chemical concentration is usually expressed as a radiochemical dosage when radon measurements are reported, however. Here in the U.S., this value equates to 0.4 pCi /L (picocuries/liter); elsewhere in the world, it is expressed as 0.0148 Bq/m3 (Becquerels per cubic meter). For those interested in the numbers, a picocurie is just 0.000,000,000,001 (one-trillionth) of a Curie, which is one of several internationally used units of radioactivity measurement. A concentration of 1.0 pCi/L means that in one liter of air at that at level there will be about 2.2 radioactive disintegrations per minute. At a level of 4.0 pCi/l, therefore, approximately 9-10 radioactive disintegrations will occur each minute per liter of air (see radon reference level below). This amounts to about 1 per second within the average human lung volume of 6 liters. The adjacent nuclear reaction shows the portion of the decay of Thorium 232 into Lead 208 that produces Radon 220 gas. Rn 220 is often referred to as "thoron" but due to its relatively low abundance (5-15%), it is typically lumped together with Rn 222 as "radon". A quick comparison will show that there are approximately 27 Bq/m3 for each 1.0 pCi / L, so conversion from one unit to the other is quite straightforward. A reference value of 4.0 pCi/L - (108 Bq/m3) has been established by the Environmental Protection Agency (EPA) as the level at which radon levels are considered to exceed the “normal” or “acceptable” background range for living spaces; this concentration is about 10 times what background atmospheric levels are known to be. The reference value, however, is not based on any observational criteria or known set of physiological effects at that level. It is rather a concentration at which “concern” should be considered prudent, most likely because it represents an environment in which radon levels are a full order of magnitude (10X) higher than average background levels. Allowable workplace levels have been similarly set by the EPA at the higher value of ~15 pCi/L - (400 Bq/m3) which is about 4 times the level established for living spaces. The health effects due to radon inhalation are typically estimated using the so-called "Linear No threshold" (LNT) relationship. This assumes that the radiation effects produced from low level irradiation can be predicted quantitatively by linear extrapolation of the effects produced with high level irradiation. This assumption implies, therefore, that any amount of radiation, however small, is potentially harmful. The adjacent nuclear reaction shows the portion of the decay of Uranium 235 into Lead 207 that produces Radon 219 gas. Rn 219 is sometimes referred to as "actinon" but due to its extremely low abundance it is usually considered along with with Rn 222 and Rn 220 as "radon". There is quite a bit of variation in concentration seen at ground level in some areas which is primarily due to differences in local rock types and their geochemical affinities. With the measurements I have performed, the atmospheric average is more closely approached at a few meters above the ground. 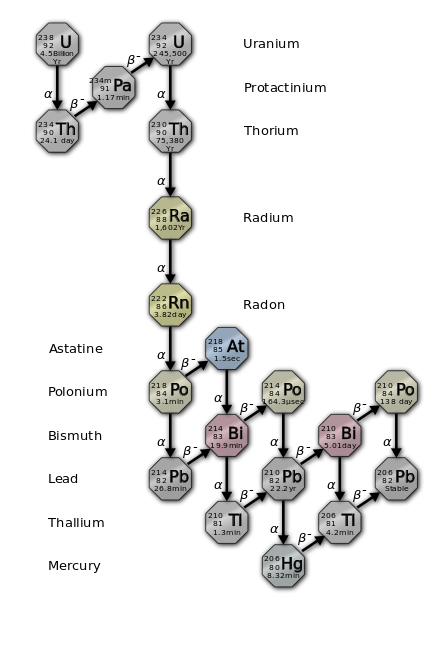 The following diagrams show the complex radiochemical mechanisms for uranium (U) and thorium (Th) decay, which transition through no fewer than 10 daughter forms each before they decay into one of several stable isotopes of lead (Pb). 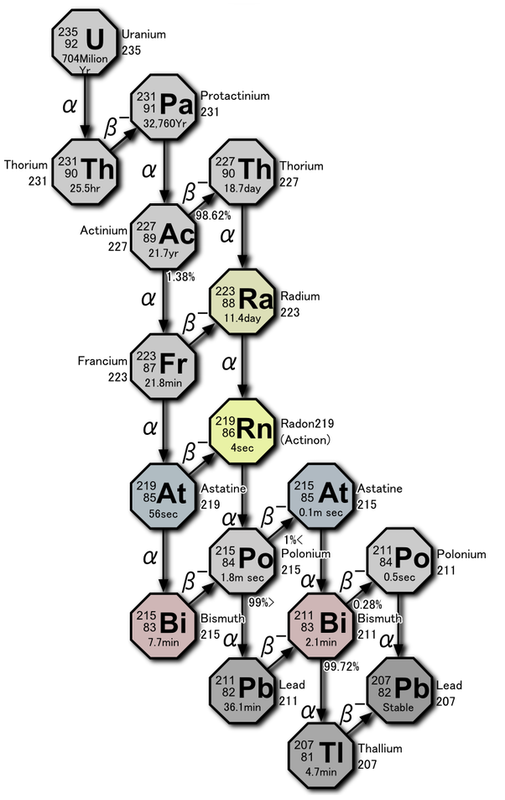 These decay chains each produce a single radon (Rn) daughter in the central part of the string, which makes the various radon isotopes the parents for all the reactions down-chain from that point. 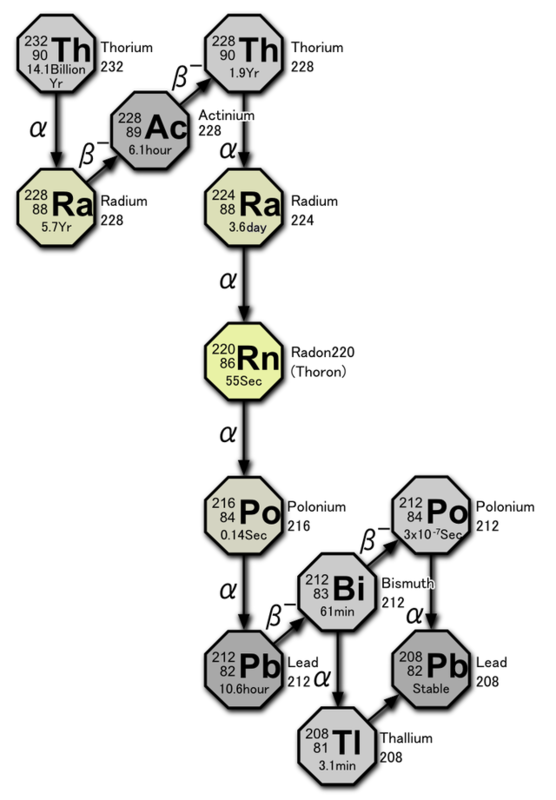 The radon isotope phase is the only point within each chain where the product is a mobile gas, and the principal stage at which environmental dispersion takes place. All of the various daughter products are much less mobile post-transition metals that range from moderately to extremely toxic, both chemically and radiochemically. This is why radon exposure levels should always be considered when any long term extended exposures are a possibility. Radon gas is almost 8 times as dense as air and diffuses slowly, so it tends to become enriched in low spots and within closed spaces. Some would argue that this is not the case or even possible, but from a purely empirical standpoint, the low and closed spaces measured within caves follow this trend more often than not. Radon exposure levels can become very significant when in a highly enriched closed space like a uranium mine, thorium mine, or within a well or basement dug into rocks enriched in the suite of lithophile elements that U and Th are typically associated with. Radiological exposures to radon are usually considered as averaged over time and can approach prohibitive levels with prolonged exposures at high concentration levels. In general, radon concentrations in caves are higher than within open air settings, which is understandable considering that caves typically have restricted air exchange potential with the external atmosphere. Radon is known to reach highly elevated concentrations in some North American caves (rarely up to 500 pCi/L and above), but in general American caves have somewhat lower Rn levels than have been reported in European caves and elsewhere. Limestone has a higher background level of uranium than other sediments due to its high calcium (Ca) content, and therefor most limestone caves have radon levels that exceed atmospheric levels. The primary determinant for finding elevated background levels, however, is the nature of the underlying and adjacent bedrock, as well as the geochemistry of the local groundwater. This is true within both cave-blessed and cave-deprived areas. To keep things in perspective, however, it best to be aware that many basements and the lower levels in well insulated homes will contain radon levels that are comparable with those found in many cave systems. The only way to know for sure whether a particular cave has a high radon level is through testing. This is usually done through measuring long term averages at one or more locations within a cave or by spot checks in various locations at different times of the year. The National Park Service (NPS) has done numerous long term radon monitoring studies in several of the nation’s largest cave systems which has looked at cumulative radon dosages over time for both its employees and visitors. The EPA has done a similar analysis that also included recreational cavers. These studies concluded that neither employees nor frequent visitors or recreational cavers experienced significant increases in lifetime exposure levels, considering the short duration of most of their visits. 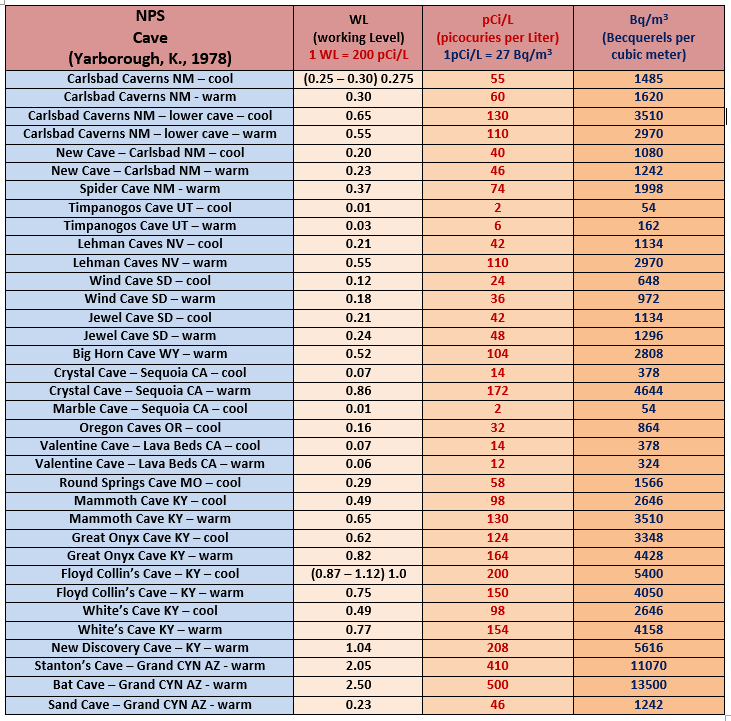 Looking at the NPS sites evaluated in the chart above, there is some tendency for eastern and southwestern caves to have higher Rn levels than those in the west, but the data set is certainly not all inclusive. Some caves have quite a bit of variability in radon distribution, but others like Wind Cave have relatively homogeneous values. Those of us that work in and or are frequent visitors to caves, therefore, are generally only rarely at a higher risk from these short term ventures into the Stygian depths. The possibility for encountering high Rn levels within a cave that has not been previously evaluated can usually be anticipated, however, based on local geology and nearby rock associations. Radon tracking is not an imperative in most situations, however, due to the short term exposures that are generally experienced when visiting most caves. It is, however, advisable to consider when it is planned to visit a particular cave over an extended period of time. Aside form its obvious value for addressing health risks, radon testing and distribution profiling can also be an excellent tool for better understanding the dynamics of a complex cave system’s atmosphere, due to the element’s very high density and relatively slow diffusion characteristics. The complex patterns of flow, air exchange and stagnation can be in many cases better understood with information on the heavy gas components within a given system. To this end, radon is a a relatively easy, economical gas to measure and quantify. This is typically done through the use of short and long short term track etch monitors, as well by the use of hand-held continuously recording meters. Top of the line monitoring equipment can be quite pricey and is usually quite bulky, but a well protected hand-held device in a pelican case that is allowed to breath during spot checks works very well, gets the basic information desired and is a heck of lot more affordable. Thermal waters often have distinctive solute, gas and radioisotopic characteristics that may impart a distinctive fingerprint to the system’s groundwater and atmosphere. Radon analyses can in some cases help to determine the presence of hypogene components in the phreatic portions of a system where thermal waters may have had a hand in the dissolution process. This is particularly true if isotopic analysis are available, as groundwater radiochemistry can be be very distinctive depending on its source. Monitoring/profiling of radon levels has also provided insight into how elevated Rn levels within a cave may affect the distribution of its cavernicole (cave dwelling) inhabitants. Bats, in at least one study of four caves in Mexico, seem to have figured out that the highest radon areas in these caves are not the best areas for roosting and colonies. It would be very interesting to see whether this adaptability pattern extends to cave systems across North America and elsewhere. Bats have relatively long lives (~20 years) and extremely high metabolisms, so all things being equal, one would expect high rates of radon-related mortality in these creatures due to the amount of time they spend in high radon environments. To the best of my available knowledge, this theory has not been thoroughly tested as of yet...hmm...sounds like a great PHD or post-doc project to me. So many questions...so little time! !